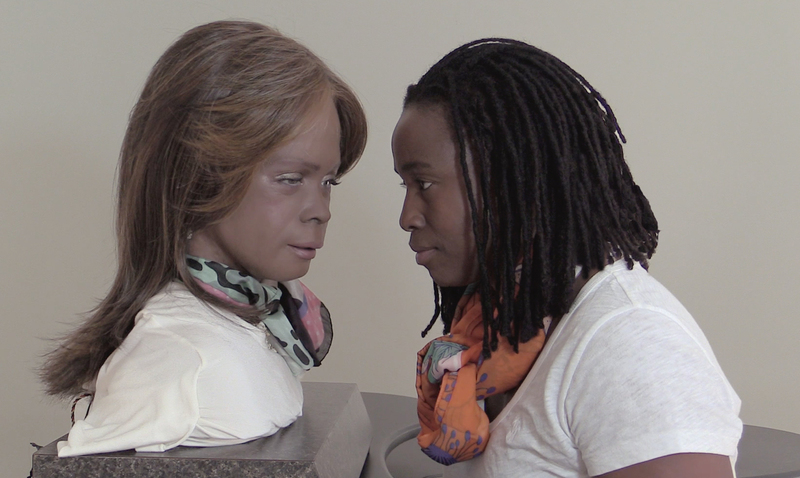 Stephanie Dinkins is a transdisciplinary artist interested in creating platforms for ongoing dialogue about artificial intelligence (A.I.) as it intersects race, gender, aging, and our future histories. Her art employs lens-based practices, the manipulation of space, and technology to grapple with notions of consciousness, agency, perception, and social equity. Her work has been exhibited at a broad spectrum of public, private, and institutional venues by design. These include Institute of Contemporary Art Dunaujvaros, Herning Kunstmuseum, Spelman College Museum of Fine Art, Contemporary Art Museum Houston, Wave Hill, the Studio Museum in Harlem, Spedition Bremen, and the corner of Putnam and Malcolm X Boulevard in Bedford-Stuyvesant, Brooklyn. She is the recipient of financial support from Joan Mitchell Foundation, Puffin Foundation, Trust for Mutual Understanding, Lef Foundation, and Residency Unlimited. Artist residencies include NEW INC; Blue Mountain Center; Aim Program, Bronx Museum; The Laundromat Project; Santa Fe Art Institute; Art/Omi and Center for Contemporary Art, Czech Republic. Her work has been written about in media outlets such as Art In America, The New York Times, Washington Post, Baltimore Sun, and SLEEK Magazine. She is a 2017 A Blade of Grass Fellow and a 2018 Truth Resident at EYEBEAM, NY. Professor Dinkins teaches digital media at Stony Brook University.